It is time some things were straightened out on this blog, and proper acknowledgement given. 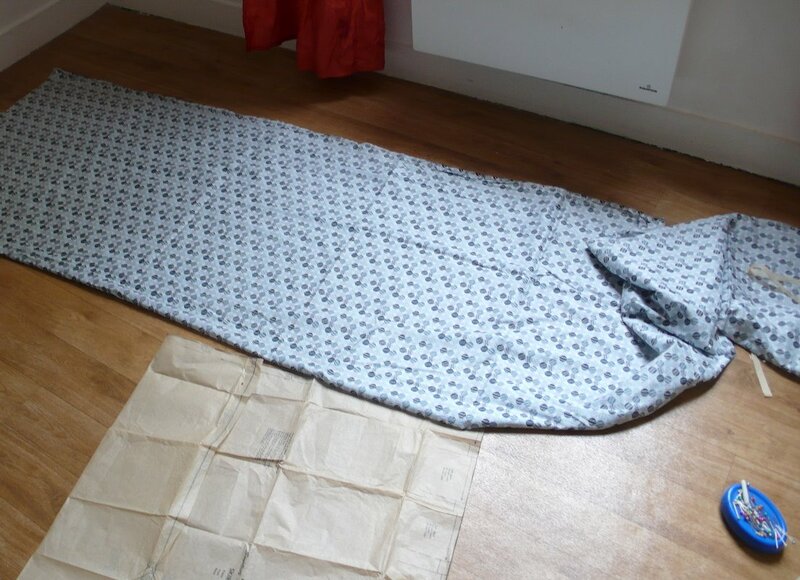 When you see this piece of Liberty fabric laid out on the floor of a Paris apartment, you may be led to think that Isabelle is getting down to business. Appearances, however, can be deceitful. I, P’tite Mignonne, am really the one in charge over here. Next time Isabelle shows you a project – remember who truly deserves the credit… Part of it anyway. See you soon with pictures of the finished object! My terrier, Rosie, would like to compliment you on your restraint. She recently discovered the superb flavor of paper patterns and has now instructed me to keep patterns well out of her reach so that she does not consume them. I am, of course, being very obedient! Great to see you back, Isabelle. We’ve never met, but you keep me inspired from afar! Thanks so much for posting the photos of the true artiste in the familiy. I have three of those also. It’s amazing that felines around the world have this thing in common: sewing. So glad to see you back here. Love to see your creations. Oh P’tite Mignonne, I never doubted that you had a hand in Isabelle’s creations. Happy sewing! very cute how you captured the right shots. Oh C’est trop mignon ! Bravo Petite Mignonne. How wonderful it must be to live in Paris! I would love to hear what that is like! Oh Isabelle, thanks for the giggle. Like one of the other commenters, I wish Felix was as helpful! While I simply love your mom’s creations, I must say that you have shown quite a bit of restraint, more than I’d expect from a feline of your caliber, by allowing her to continually take credit for your artistic talent and energy. While it is commonly (mis)understood, an opposable thumb is NOT required for such creative endeavors. Yes, us humans frequently take your credit and seldomly acknowledge that if you hadn’t been there to direct, it would have turned into an utter mess. 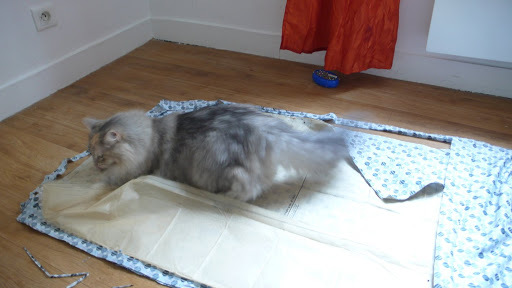 So, P’tite Mignonne, my advice to you, if I may be so bold as to offer it, continue to check your mom’s work, straighten it as necessary, and always inspect the finished garment with tail held high (depositing as many hairs as possible on the hemline). Your approval should be the only one that matters! Ahhhh Isabelle, I always knew you had an assistant! btw – you look just lovely in the skirt and top – blue looks very nice on you. Your cat is gorgeous, as always! I’m glad your back Izz! Oh P’tite mignonne, I was sure you did all the hard work! Just as my two cats and three cockatiels (in turn, of course). P’tite Mignonne you are very talented, perhaps you could give my cat Spike a few lessons? LOL! I can’t let my cats read this post. They are not allowed in my sewing room. If they see this, they’ll think they can help me, too.! Funny, funny. If only she could sew as well! Sorry, P’tite Mignonne, for my english miaowings, I usually miaow in french! Big kisses for your and your human friend! P’tite Mignonne…I must type this in haste, as Pam ~Off The Cuff~ (one of my people..the one who sews) has just walked out of the room. I yearn to create like you do, but Pam has locked me out of what she so haughtily calls her “studio”. 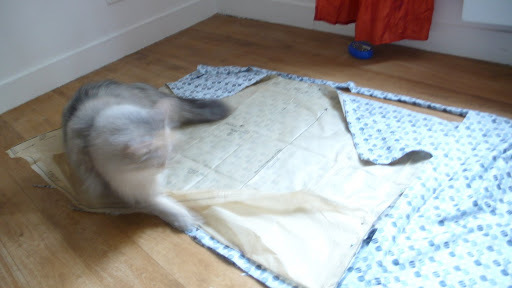 I meow outside of the door, only to be tossed a crumpled piece of pattern tissue to “play” with! Play?! I yearn to assist Pam with her designs! …and truth be told, she could use my eye for design….I could go on and on, but she’s back…..! Of course we 7 cats here run the show too! That blog of hers is always “me, me me” and it is really US!!! Laundry, cooking, gardening….who do you think does all of that while she sits around stitching? I am so glad credit was given to you finally. Ah ah, j’adore tout simplement ! Je te fais pleins de papouilles et des bisous à Isabelle. Ah ah ah … no we know the truth !! Ahh P’tite Mignonne we’ve always known that you are the mastermind behind the creations! Bonjour, P’tite Mignonne, and greetings from Lily (Karen’s “sewing assistant.” Have you ever tried eating thread? I highly recommend the stuff that comes on small plastic bobbins, the kind you can hold in your teeth while your person hops up and down and begs you not to swallow it. I hear that periwinkle blue is a particularly tasty flavor . . . Your work is very nice. It doesn’t hurt to let Isabelle take credit; that’s what I do. That is exactly how it goes at my house too. 😉 Adorable kitty, and I love your blog Isabelle. I can't imagine why anyone would leave a nasty comment for you of all people! How rude. I don't believe I've ever commented before, as I'm usually still amazed at all the beautiful things you've done…but I thought it might be time I say I enjoy your blog! I hope you find time to blog and show us your creations again soon. ahhaha, I see you have the same kind of fabric weights I do-the feline kind!! !